AlixeArts – Jewelry & Accessories for Unconventional Women – Caroline Alixe Rhuys is a member of the artistic community in Reno, NV. Caroline uses beading, painting, and needle felting to create mixed-media jewelry and accessories. She creates her jewelry and accessories from materials found in local thrift stores and her extensive stash of vintage fabrics, buttons, and hankies. Some favorite materials are silk, leather, buttons, beads, wool felt,, ribbons, and found objects. Caroline enjoys meeting other makers and supporting them by sharing their work throughout her online and personal networks. I met a woman this evening at the 1 Million Cups anniversary event who is starting a new business. She commented that she “hates social media.” I would certainly prefer to spend my time teaching craft classes and creating clothing and jewelry instead of sitting at my computer. However, I have been learning that strategic use of social media outlets is crucial for small businesses. Facebook, Instagram, email, blogging, etc. are useful marketing resources for people who have little money, but who are willing to invest time in marketing their products or ideas. Putting up a website and/or opening an online store to sell your products or services is useless if no one knows you are there. In some ways, Google has simplified the process for making a business searchable online. A business can increase its visibility by posting worthwhile content on a consistent basis. I am building an email list so that I can send updates on my craft classes and upcycling projects. Taking photos and posting them online does not come naturally to me, but I have recently started posting photos to my Facebook page and on Pinterest. One thing I do enjoy is sharing things I learn. Although I do shop at craft stores, I also find tools and crafting materials in unusual places. For example, I bought silicone trivets to make designs on fabric for the upcycled clothing I create. I also discovered that sponging paint on an old-fashioned potato masher and pressing it onto fabric produces a cool design. Keeping a notebook handy can be helpful in generating ideas for postings. Sometimes I just draw a picture of something so that I can refer to it later. This posting was inspired by a conversation. Who knows where your next idea will come from? Author AlixeArts - Jewelry & Accessories for Unconventional WomenPosted on March 26, 2015 March 26, 2015 Categories Crafts, Marketing, Social MediaTags crafts, fabric painting, marketing, social media, upcycleLeave a comment on Why Social Media for Business? Teaching crafting classes is also an opportunity to meet new people and share my knowledge and creativity. Sometimes a person needs more than a single source of income. Finding a way to generate multiple sources of income is often worth the effort required. I make one-of-a-kind clothing and accessories, so once I sell an item, I have to make something new. By teaching crafting classes, I can generate income on a more continuous basis. Teaching crafting classes is also an opportunity to meet new people and share my knowledge and creativity. There are a many factors involved in deciding on the fee for a craft class. Supplies are only a small part of the expense involved in preparing for a class. A lot of advance preparation is required for a class to be successful. The most difficult item to quantify is the time involved in learning a new technique. This time and effort is valuable. The next class on my schedule is Basic Victorian Ribbonwork. I can make a folded ribbon rose in a few minutes, but that was not the case when I first tried it. I bought numerous books, spent many hours practicing, and bought yards of ribbon. I learned many of the techniques I teach from “The Artful Ribbon” by Candace Kling. 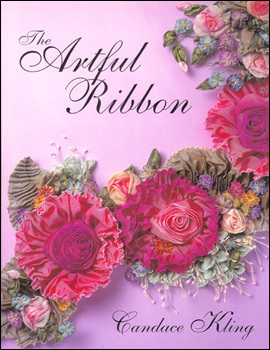 “The Secrets of Fashioning Ribbon Flowers” by Helen Gibb was also helpful. Although I use the traditional methods I learned to fashion roses, lilies, tulips, and other flowers, I have developed my unique style. In summary, teaching classes allows me to share something I love, while encouraging students to try traditional techniques that are new to them. Where Did I Put That…?! Ever started a new sewing, painting, or other craft project and couldn’t find all the materials, even though you know you have them? I am sure I am not the first person with this issue. 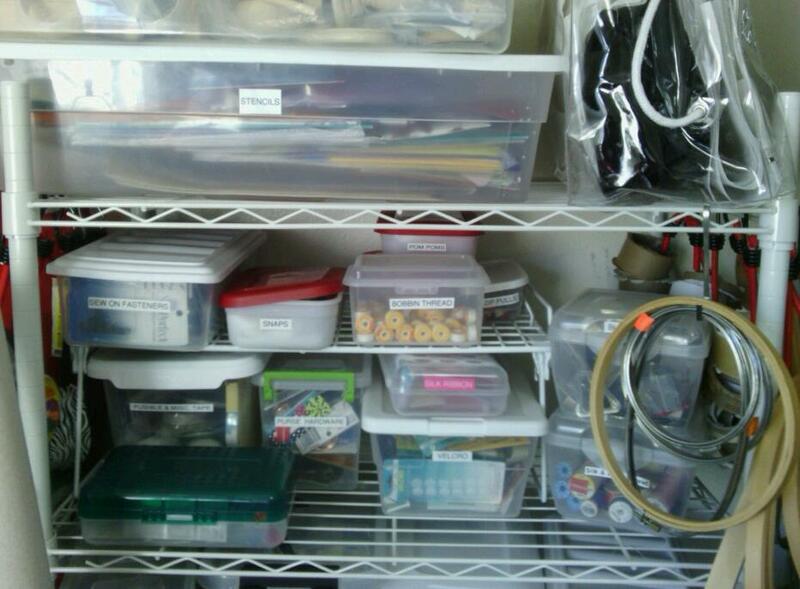 Most of my materials are in labeled containers, but I have so many that I can’t remember the location for each one. This photo shows only a portion of one of my many shelving units. I decided to fix my problem by making a list with each container along with a diagram of its location. Then, I lost the list! Determined to go forward, I started another list and even rearranged some of my fabric. I try not to have too many “miscellaneous” containers, because it is too easy to throw stuff in them “for now” then waste time looking for it later. Being able to start and finish something right when I get the inspiration is so much more satisfying than having to stop in the middle to look for that little piece I am missing. Author AlixeArts - Jewelry & Accessories for Unconventional WomenPosted on March 5, 2015 March 5, 2015 Categories Crafts, Organizing, StorageTags crafts, creativity, organizingLeave a comment on Where Did I Put That…?! I started teaching some classes at Truckee Meadows Community College (TMCC) in September. One of the best things about going to classes, as a teacher or a student, is meeting new people who share common interests. My first class was on creating beautiful jewelry from fabric. Although many types of fabric may be used, some of my favorites are silk and Ultrasuede®. I like to paint the fabric before I incorporate it into a jewelry design. One of the methods I use for silk is making rubbings using Shiva Artist’s Paintstiks®. Commercial texture plates are fine, but I also like to find everyday items and use them to create unique patterns. The above photo is a sample of a rubbing made from a silicon trivet that I found at a dollar store. One of the students from my fabric jewelry class invited me to speak in front of her quilting group regarding embellishment techniques. I demonstrated rubbings made from polymer clay, paper crafting, and UTEE texture plates, along with textures created by plastic sink liners, silicone trivets, and other items. One of the drawbacks to using Paintstiks is that the paint can be difficult to remove from your hands. One of the women in the quilting group had a wonderful solution. She recommended using a mixture of dish soap and sugar to remove the paint. Commercial cleaners are available, but how great it is to use materials you already have around the house! I look forward to teaching my next class. Who knows what I might learn? Vintage Hankie Lavender Sachets. Now available in the Indie Reno Boutique. Does your mother deserve a break? 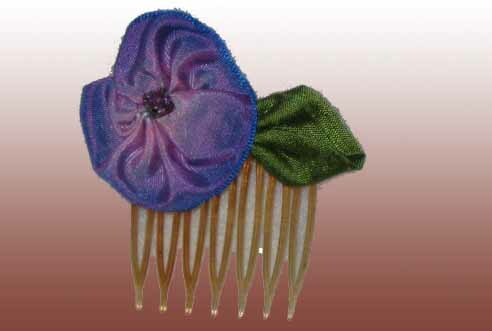 Give her a lavender eye pillow with a washable vintage hankie cover. There are a few currently in stock at the Indie Reno Boutique. I have a stash of over 400 vintage hankies, including many with initials and I am happy to take requests. The spring and summer weather in Reno is generally pleasant, anyone who lives here knows that the winds often kick up in the afternoon. The gusts can be quite impressive, so I decided to make some weights to keep my canopy earthbound at the shows I am scheduled for this year. The instructions are clear and a web search indicated that many vendors find this style of weights to be satisfactory and reasonably easy to transport. The problem I ran into is that I couldn’t find all the materials. Lowe’s had some of the required materials, but they were not able to cut the 10’ pipe into the lengths I need. Home Depot had only a couple of the items I need. I was hoping to get everything at Lowe’s since I have a gift card with them. Frustrating! I am not giving up! Tomorrow I plan to call local plumbing suppliers and Ace Hardware. I will be at the Reno Earth Day celebration on Sunday, April 21st, along with several other Indie Reno artisans. For more information about the celebration, go to http://renoearthday.webs.com/. I hope the weather this year is as nice as it was last year. Author AlixeArts - Jewelry & Accessories for Unconventional WomenPosted on April 14, 2013 Categories UncategorizedLeave a comment on Battling the Reno Winds!